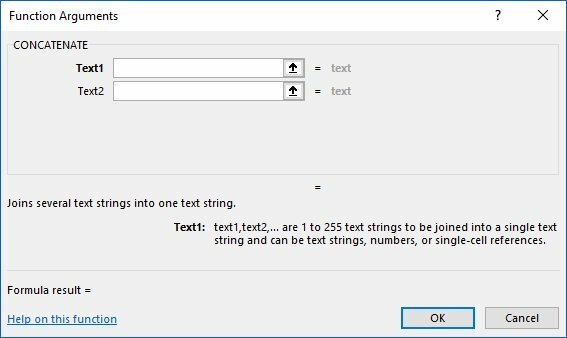 This week I had a request to show how to join text together from different columns in Excel. I don’t know about anyone else but I personally know that in my early years working in Excel, I spent many many hours retyping data from one column into another when the need arose or when data had been split between so many columns that things were just out of control. Sometimes when a new set of data is created, we don’t envisage what the future requirements of that information will be, so somewhere down the line, the format your data is presented in does not meet your new requirements. To save yourself some time and some sanity, you can utilise a function in Excel to make this process a breeze. I’d like to introduce the concatenate function. The meaning of the word concatenate is to join things together, and that is exactly what the concatenate function will do for you in Excel. This function is always a popular one during training courses. For users of Excel 2013 and above, you may like to investigate the Flash Fill tool which provides the functionality of concatenate but packages it in an easy to use new feature. Place your cursor in the next available empty cell in a blank column or insert a new column if needed. So that Excel puts a space between the house number and the name of the street, you need to include a space character. 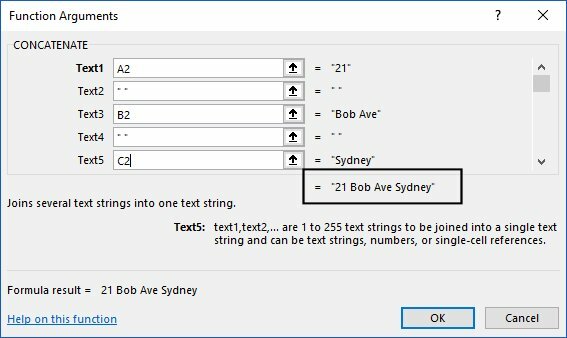 If you selected the cell with the street name in it as text2 without first putting in a space character then Excel will display the two pieces of text with no spaces between. Important Note: If you delete column A, B or C which contain the individual information, column D will display an error so you must leave them in the spreadsheet. For visual purposes if you wish to have these out of sight, simply highlight the two columns, right mouse click and select Hide. Have fun using this function to combine text strings.